When natural disasters occurred, a fundamental question after information about the scene, the victim and material loss, is why and how the disaster happened. However, not infrequently also the victims of religious identity has always been associated in the news. For instance, we have not forgotten the tsunami disaster in Indonesia hitting Aceh in December 2004 with the majority of Muslim community. A few weeks earlier, an earthquake occurred in Alor, East Nusa Tenggara, which is predominantly Christian. The religious identity affects the response and post-disaster relief distribution. Implicitly, it shows how the relationship between religion and disasters as a shaper of social reality in the study of disasters in Indonesia. Unfortunately, the relationship of religion and the victims of the disaster have not been fully studied. Only recently have researchers realized and become more open to the importance of religious awareness. “On the Connections between Religion and Disaster: Literature Review” ‘is one of the great works that represent disasters and religious studies. Through the internship program with CRCS during September 2012 to January 2013, Lotte Kemkens, a Master student of Wageningeng University Netherlands has finally succeeded in revealing this literature review. This book, related to religion and disasters, is part of an effort to map the contemporary discourse in discussing natural disasters in Indonesia, Sri Lanka, Italy and other countries. This book described how religion and disasters linked in practice and theory. Lotte candidly began her book by giving a basic understanding of the religious definitions, dimensions, functions and social construction in view of religion. 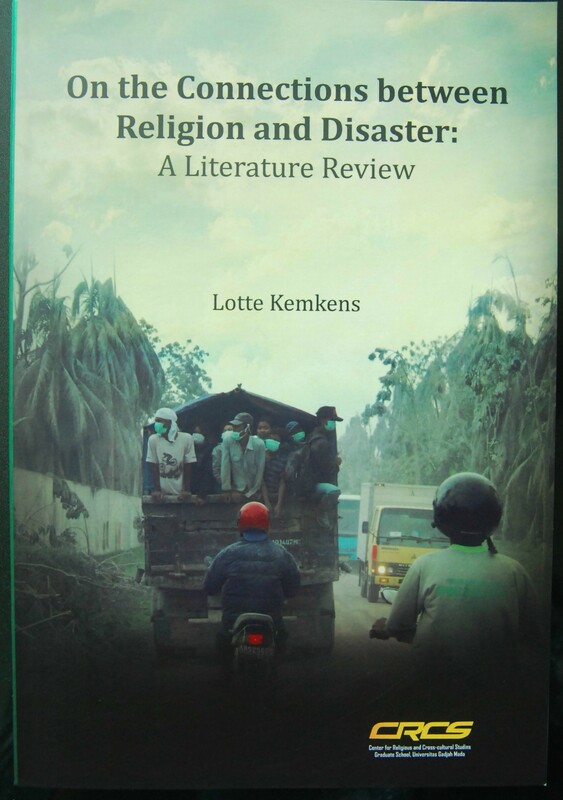 Lotte stated that the concept of disaster has an important role in religious doctrine and theology. Especially in the monotheistic religions, people are faced with many challenges. One of them is how they have to reconcile the idea of God the Almighty and Benevolent with the idea of human suffering. Further, Lotte also portrayed an approach to politics and anthropology of religion. The author argued that religion is essentially beneficial for many people but it is important to note that in a certain community, religion may restrict and marginalize certain communities. When people are marginalized and constrained by their religious identity, then in time of disaster religion will influence. An example is the handling of the aftermath of the uneven distribution due to the discrimination based on religion. This happened in Bangladesh where Hindus were more difficult to get food aid than those who are Muslims.